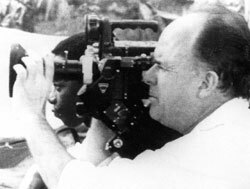 Filmmaker Jean Rouch: 1917 – 2004. Photo courtesy of First Run/Icarus Films. French filmmaker Jean Rouch, considered the father of cinema verite, died last week in a car crash at the age of 86. The director’s “Chronicle of a Summer” (1960) was hailed as a bold new type of documentary, made in a time when technology created new opportunities and flexibility — namely a portable, hand-held film camera and a sync sound system. It was a film that also inspired the work of the French New Wave filmmakers in the 1960s. Rouch was attending a film festival in Niger at the time of his death, a country that was in many ways his second home. Born in Paris in 1917, Rouch, an acclaimed ethnologist, spent much of his time in Niger documenting life there. The accident occurred north of the country’s capital of Niamey; Rouch was traveling with his wife, Niger filmmaker Moustapha Alassane and actor Damoure Zike who was injured, but survived the crash. He will be buried today in Niger. According to stories widely reported, Rouch adopted the hand-held style after losing his tripod in a river in Niger. In the landmark “Chronicle of a Summer,” Rouch and his co-director Edgar Morin asked Parisians the simple question, “Are you happy?” The answers created a stunning document of contemporary life in the city. Rouch ran the Cinematheque Francais for four years and continued to work even into the 90s. He was in Niger to present a retrospective of his work at the time of his death.